Topped off with a little honey and spice, this creative spin on sweet potato casserole will become your new favorite breakfast bowl. Microwave the sweet potato on high heat until soft (5-6 minutes). Meanwhile, prepare the oats according to package directions, using water as the liquid. Remove the sweet potato flesh to a bowl and add a couple tablespoons water. Mash until smooth. Stir into the cooked oatmeal and transfer to a serving bowl. 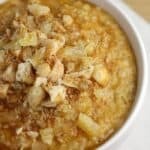 Top the oatmeal with the candied pineapple, macadamia nuts, toasted coconut, and nutmeg. Drizzle honey over top and serve. Yields 1 serving.